Illustrated: Models (Poseuses) 1886–1888 Oil on canvas78 3/4 x 98 3/8 in. From November 1880 until his debut with the Bathers at Asnieres, Seurat worked independently. He shared a studio for two years in rue l’Arbalète, 5th Arr. From 1882 he rented a small studio in rue Chabrol, 10th Arr. Sketching trips to Barbizon, to family properties in Parisian suburbs, to Burgundy and to Rhine. September 1870 defeated Second Empire France replaced by Third Republic. Siege of Paris followed by suppression of the Paris Commune. Third Republic calls for revival of France through nationalistic projects. Among them the decoration of the Pantheon by mural painters, the revival of the Prix de Rome and the increased weight given to officially-sanctioned History painting. Modernity and mass-culture were seen as a threat to the values of official history painting. Charles Blanc, Grammaire des Arts du Dessin (1867): approved of both Ingres and Delacroix, a critic of its later practitioners. An opponent of Third Republic schemes to bolster the French Academy, he had attempted to establish a Museum of Copies. Or masters: Poussin, Puvis, Ingres, coupled with a rejection of Lehmann. Leighton, J., Thomson, R., National Gallery (Great Britain), 1997. Seurat and the Bathers. National Gallery Publications ; Distributed by Yale University Press, London; [New Haven, Conn.]. Smith, P., 1997. 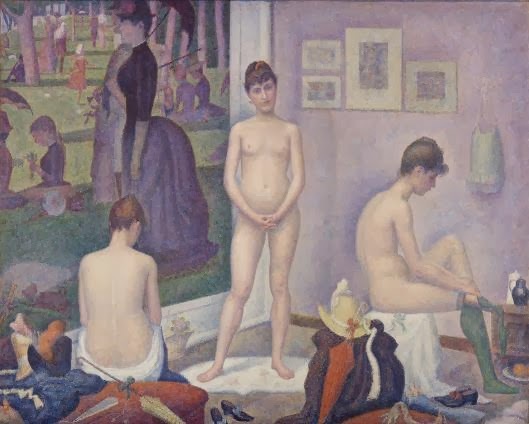 Seurat and the language of the avant-garde. Yale University Press, New Haven; London.